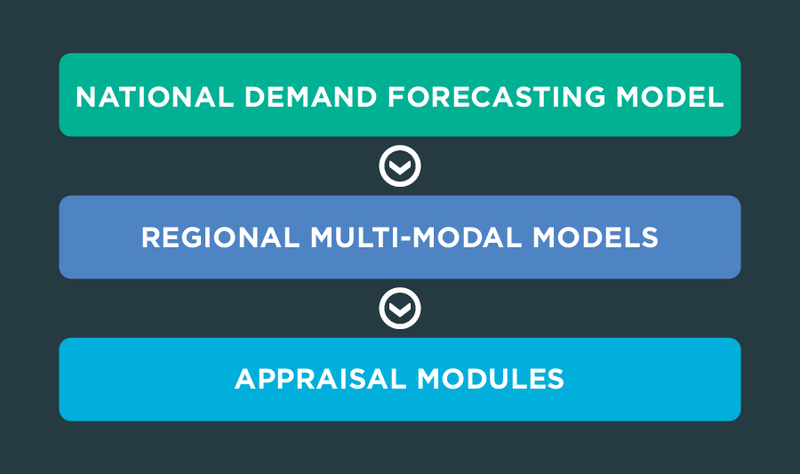 The National Demand Forecasting Model (NDFM) includes the set of models & tools that are used to derive levels of national levels of trip making from planning data, for input into each of the regional models. The NDFM outputs levels of trip making at the smallest available spatial aggregation, the Census Small Area (CSA) of which there are more than 18,000 across the country. There are 5 regions: East Region, West Region, South West Region, South West Region, and Mid-West Region. The five regional models are based on a single coded Cube Voyager structure, which can be applied to any of the five regional areas solely by changing the network and zonal inputs, and calibrating to local data. The Appraisal Modules are an integrated suite of Modules for the assessment of social, environmental and economic impacts of transport schemes. In addition to the components described above, the RMS also uses Assignment Models and Secondary Analysis Tools. The Road, Public Transport, and Active Modes assignment models receive the trip matrices produced by the FDM and assign them in their respective transport networks to determine route choice and the generalised cost for origin and destination pairs. The Road Model assigns FDM outputs (passenger cars) to the road network and includes capacity constraint, traffic signal delay and the impact of congestion. See ERM Road Model Development Report. The Public Transport Model assigns FDM outputs (person trips) to the PT network and includes the impact of capacity restraint, such as crowding on PT vehicles, on people’s perceived cost of travel. The model includes public transport networks and services for all PT sub-modes that operate within the modelled area. The secondary analysis application can be used to extract and summarise model results from each of the regional models. Forecasting for any year for which land use (planning data) and infrastructure provision assumptions can be provided. Normally these are prepared for 5-year increments from the base year model (e.g., 2017, 2022, 2027 and so on) to support short, medium and long term horizon planning and appraisal. Light Goods Vehicles and other Goods Vehicles in the Road Model. Off-Peak covering the period between19.00 – 07.00. In the assignment of trips to the transport networks, a representative single hour is extracted to represent each time period. The datasets determine the demand segmentation possible, i.e. 2011 POWSCAR and the 2012 National Household Travel Survey (NHTS) (described below in Section 2.4.1). The proportional number of trips by demand segment must be reasonably large to warrant being treated separately as a distinct segment. Segments that represent very small proportions of overall travel demand are combined. The model considers different levels of segmentation at different stages of the modelling process, with only the relevant segmentation retained at each step. Model responses to changes in populations, jobs, etc. are generally improved when the fundamental information—travel demand—is segmented. National Household Survey (2012 NHTS). Leap Card ticket sales data. The standard geographical units available for zone system development are provided by the Census at the Enumeration Areas or Census Small Areas (CSA) levels. The model zoning systems are based directly on these boundary systems. Special ‘point’ zones, which have no associated boundary, are also used in the modelling to represent airports, ports, or any other location with unique trip making characteristics. Special Generators/Attractors – large generators/attractors of traffic such as Airports, Hospitals, shopping centres etc. are allocated to separate zones. ERM Zone System Development Report. Please see the SERM Zone System Development Report for more information. The MWRM has 454 Zones. Please see the MWRM Zone System Development Report for more information. Please see the WRM Zone System Development Report for more information. The SWRM has 792 Zones. Port of Cork – Tivoli. Please see the SWRM Zone System Development Report for more information.